Vanilkový Cukor - Vanilla Sugar. In Pauline's cookbook she wrote it as "Cukro Vaniliji", Slovak spelling no longer in use today. As I made Pauline’s vanilla sugar recipe today, my husband lay rocking back and forth on the hammock in the backyard, eyes closed, listening to music strumming through the headphones, blissfully unaware that a strange man had run up and stood over him, panting and sweating profusely. Nick’s eyes fluttered open, his startled eyes locking with those of a nervous young man of Middle Eastern descent, and he dropped his iPod to the ground in surprise. “What are you doing here?”, Nick demanded. The young man bent over and picked up the fallen iPod, reconnected it to the cord dangling from Nick’s ears, and handed it back to him, somewhat politely. “I’m looking for my parents,” the stranger said in a heavy Arabic accent, as his eyes darted nervously about the yard. He then gestured to two nearby lawn chairs, and asked Nick if he would like to join him there. “And could I have a glass of Cognac?” he asked. Nick wasn’t sure if the two were understanding one another correctly. Nick shooed the stranger out of the yard and called the police as I poured the vanilla sugar into the jar and decided it best to move on to mixing drinks. Our Icelandic Arabian was located a little while later in someone else’s backyard where a similarly bizarre conversation also took place. Off Monsieur Cognac was whisked, back to the mental hospital where he had escaped from earlier in the day, the police reported. Nick and I later sat down with our drinks and pieces of cake dusted with our superior vanilla sugar, contemplated what could have been, and considered ourselves lucky that the mentally ill stranger in our yard apparently wanted nothing more than to have a seat and a shot of fine French brandy. Many of Pauline’s recipes call for vanilla sugar, usually sprinkled on top of the cakes, crepes and other Central European desserts. 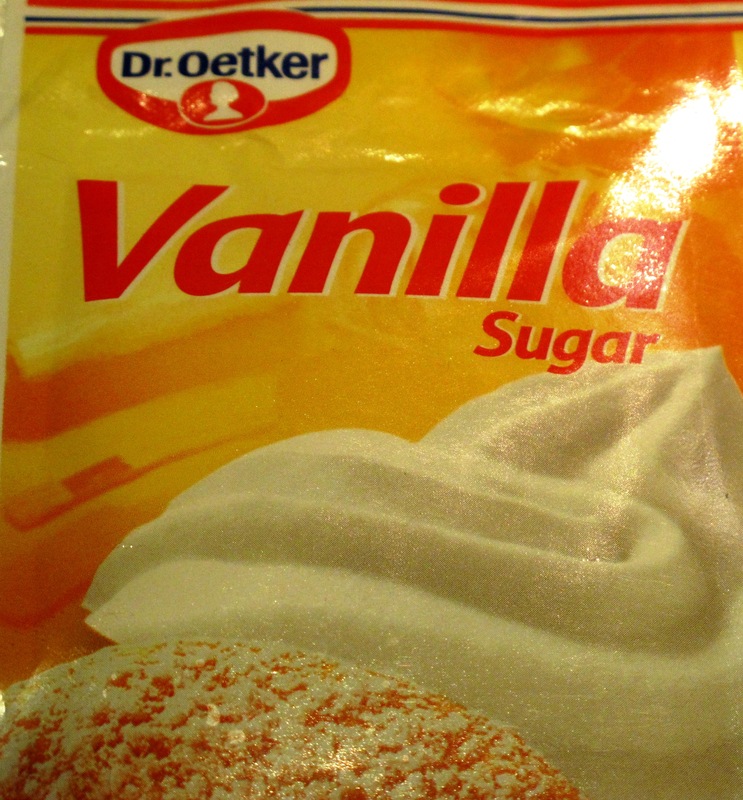 Vanilla sugar is fairly uncommon in the US, but you can find it in some supermarkets (at least in Canada) in small yellow packets made by the 120 year old family owned German company, Dr. Oetker, though it is made with the vastly inferior imitation vanilla flavor, vanillin. Pure, home made vanilla sugar is less expensive, more fragrant than store bought, and imparts a much richer flavor to desserts. When Pauline baked, vanilla sugar was made from scratch and kept on the shelf in her kitchen, ready to be sprinkled on fruits, added to coffee, whipped cream, milkshakes or yogurt and of course, used for baking in desserts. Here is Pauline’s recipe for making your own superior vanilla sugar; generally, only one tablespoon is all you need to use in a recipe. 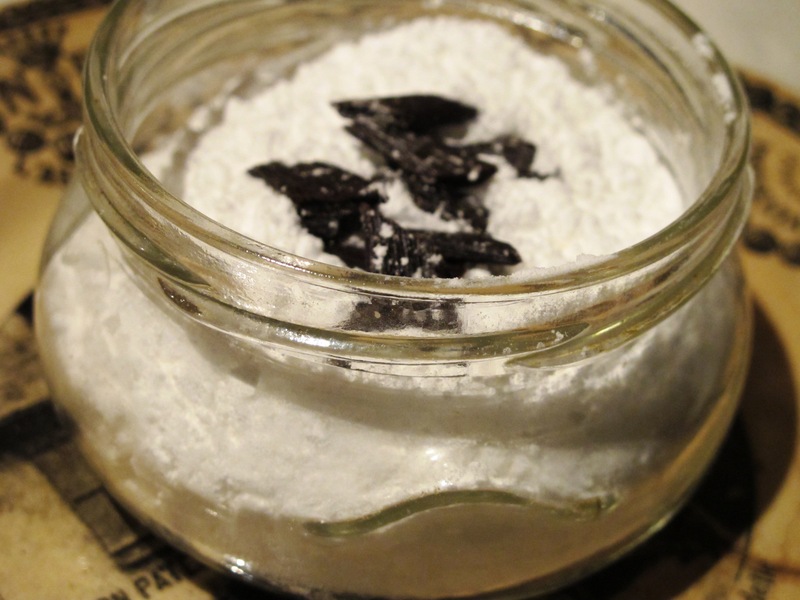 Fill a glass jar with icing sugar (or superfine sugar) and 2 pods of vanilla pods, cut up. Seal the jar and shake it to spread the pods through out the sugar evenly. You can keep the jar out on the counter with the lid on, and sift the sugar on your desserts as needed. When the jar begins to run low, simply fill it again with more sugar, as the vanilla pods will last a while. When the scent of vanilla begins to fade, simply add another cut up pod. Hi Lubos, thanks for the info on where to buy the packets. I just posted a bit about the Dr. Oetker company in response to another comment about vanilla sugar. It had strong ties to the Nazi party at one time. Hi Lidija, I did a little research on the Dr. Oetker company. The founder was a pharmacist who premixed baking powder with flour and sold it as “Bakin” back in the late 1800’s. When he retired, he passed the helm on down to Dr. Richard Kaselowsky (the man who married Dr. Oekter’s daughter in law when Dr. Oetker’s own son was killed in WWI). Dr.Kaselowsky was a member of the Nazi party and the Dr. Oetker company won the prestigious “Nationalsozialistischer Musterbetrieb” distinction in 1937. I also believe the vanilla sugar product wasn’t available until well after WWII. Interestingly, I just discovered that in 1995 Dr. Oetker Co bought a Canadian company I grew up with – the Added Touch. It was a store in Oakville, ON owned by my classmate’s mother. For some reason it feels strange to buy products that were manufactured by a company that was highly regarded by the Nazis. Perhaps because the Nazis murdered my great uncle, a Partisan from Pivcnica. Yikes, what a scary encounter! I love making homemade vanilla sugar and cinnamon sugar. There is something so comforting about having those jars at the ready. I love making flavored sugars too – am going to try some new ones this month.